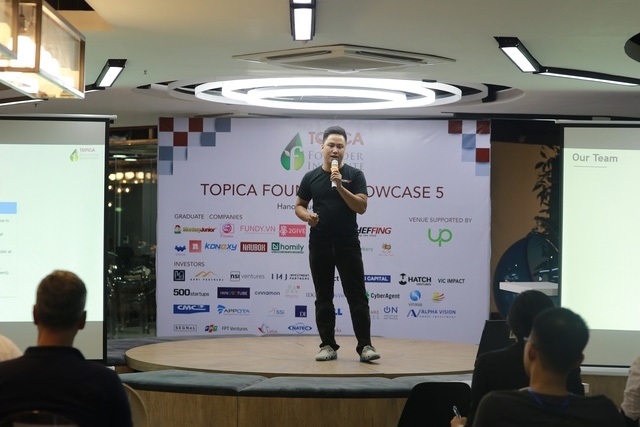 Eight out of 14 start-ups of the Topica Founder Institute (TFI) introduced their products and called for investment at the Topica Founder Showcase 2016, held in Hà Nội on Wednesday. These start-ups presented their products to 40 domestic and international investment funds, such as IDG Ventures, Unitus Impact, NSI Ventures and 500 Start-ups, besides KK Fund, Gobi Partners and IMJ Investment Partner. Finally, three Vietnamese start–ups -- Homily, Fundy and Wisami -- received investments at the graduation ceremony, held on the same day as the event. However, the value of the investments has not been revealed. According to the Topica Edtech Group, the top 15 enterprises that graduated from the TFI programme through five terms have called for US$15 million in investments. Some of these outstanding names are Appota, Giaytot, S3 and Kyna, besides Beeketing, Vlance, iMap and Antoree, as well as Uplevo, Atadi, Hoayeuthuong and Adtop. The Topica Founder Institute, which is a member of the Global Founder Institute Network, is a start-up accelerator programme of the Topica Edtech Group.